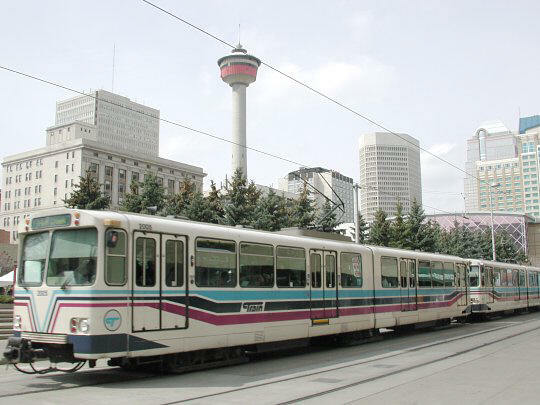 Calgary's light rail system, known as "CTrain," consists of two lines which head out from downtown on three major spokes to the northwest, northeast and south. Both routes utilize 7th Ave. SW and SE to cross the sizeable central business district on an east-west orientation. A train is heading eastbound along that route in this scene from a Saturday morning in 2002. It will shortly curve off for Fish Creek-Lacombe, southern terminal at that time. The landmark Calgary Tower is prominent in the background.